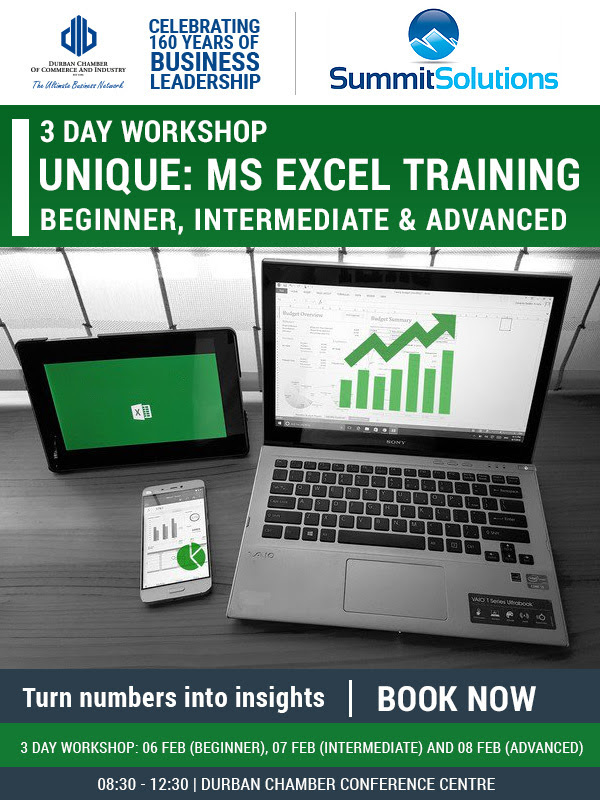 Summit Solutions, a Business Information Solutions company who offer 15 years of experience in the data management and reporting industry will be offering unique MS Excel Training that can improve both your skills and application in Excel. Excel is widely used in the corporate environment today, to manage and analyse data, create spreadsheets and generate reports. Data management, analysis and report generation are the core services delivered by Summit Solutions, making their MS Excel training unique and valuable. Attend the courses and improve your skills in Excel. Learn applications in Excel that will save you time, make your job easier and give you the tools you need to help you analyse your data and generate meaningful reports. Start improving your staff’s skill on excel and see better results in your company’s overall data management and reporting systems. certificate of attendance and refreshments.